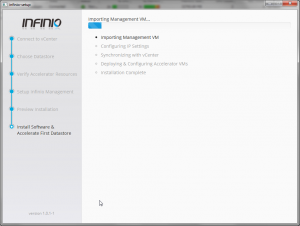 Recently I had the opportunity to speak with Infinio at VMWorld and then again at the Atlanta VMUG about their new product which at the time was Pre-GA but it was a very interesting concept from what I understood. 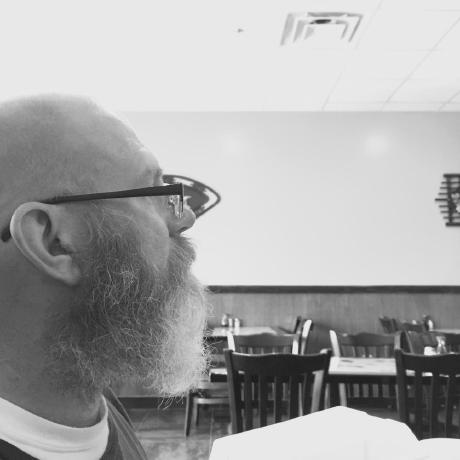 So we discussed going into more depth on their product at some point but I had been extremely busy and did not get any free time until this week to explore their product. Just from the initial demo that I was able to squeeze in I could definitely see the potential of this product and was eager to dig in further. 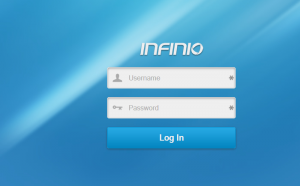 Infinio also went GA this past week as well with v1.0. 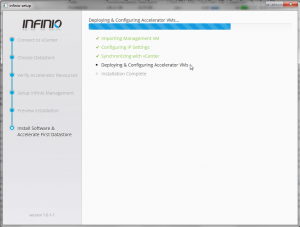 Infinio is a server side read cache accelerator which utilizes 8GB of memory from each vSphere host that you want to accelerate I/O to your backend NAS. Infinio only accelerates NFS backed datastores so it will not work on any block level backed datastores at this time. Read more about what Infinio is about here. So now that I have been able to get my hands on a copy of Infinio I wanted to dig in and do some testing to get an idea of what it can really do. 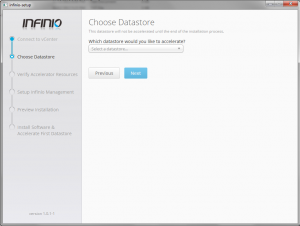 I figured I would go ahead and configure an NFS datastore from my Nexentastor NAS. Now this should make for some interesting testing I thought. 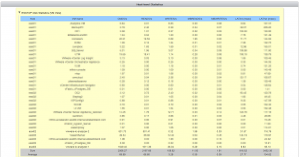 I currently have 12TB (Raid-1) usable storage which also has SSD for ZIL (Write Cache)/L2ARC (Read Cache). 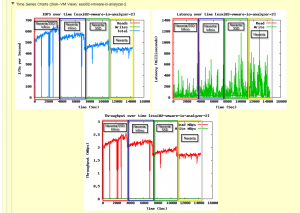 So I thought what would this testing scenario look like if I ran some VMware IO Analyzer tests without SSD, with SSD, with Infinio without SSD and then finally Infinio with SSD. 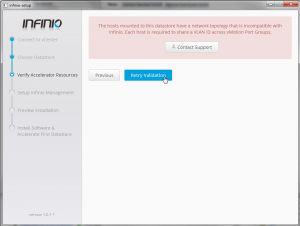 I felt this would be a good test because ZFS filesystem really utilizes SSD for ZIL when using NFS vs. iSCSI. VMware IO Analyzer (IOMeter) configured with a 100GB vmdk for testing to make sure that all IO was from disk and not from cache only. Also making sure to only put the 100GB vmdk on the NFS datastore that I was going to test and keeping the IO Analyzer OS vmdk on another datastore. I will also be going over all of the little gotchas that I ran into during setup and testing. These will not likely pertain to your setup therefore you may not run into any of these but I figured that I would share my experience with others in case you do. 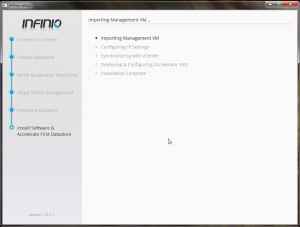 I would also like to add that Infinio support is top notch as they were a great deal of help during my testing deployment. Also note that at the time of writing this vSphere 5.5 is not officially supported so these results may not truly represent what may be seen when it is. I should also note that there was a lot of other activity going on with my Nexenta array during these tests but I figure real world would be represented, at least in my lab. There were numerous Veeam backup jobs running during this time as well so even though some of my results may not be great you can still see where the differences were. I also started out testing each scenario separately but that was not working out so well. 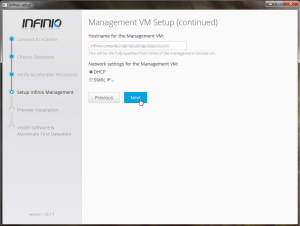 So I ended up starting a test and ran it for 4 hours starting with Nexenta/SSD/Infinio, Nexenta/Infinio, Nexenta/SSD and then finally just Nexenta alone. I injected each change every hour which is clear in the charts. 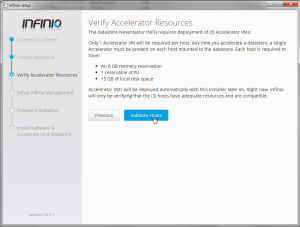 Also seeing as Infinio is a read cache accelerator I used a IO load that was 100% Read and 100% Random to get an idea of what it could do. Overall the installation is very simple and straight forward which is great. However I ran into some snags up front in regards to my current configuration of my vSphere design. I will go into this as well in case you have a similar design. Before starting have a look at the requirements statement provided by Infinio and make sure that you are in scope with it. The below is copied directly from Infinio. 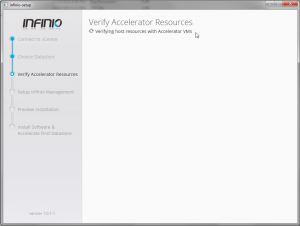 When opting to accelerate a datastore, each host connected to that datastore will receive an “accelerator VM”. 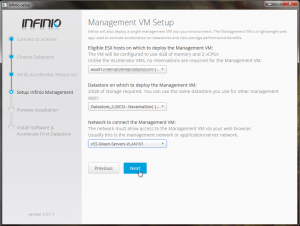 Additionally, a single management VM will be installed any desired host. Each accelerator VM requires 12 GB of local storage, 2 vCPUs, and at least 6 GB of available memory (4 GB for the VM plus a 2 GB buffer to prevent extreme memory contention). 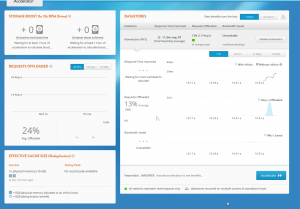 The management VM requires 30 GB of storage on any datastore, 2 vCPUs, and 4 GB of memory. Distributed vSwitches - are not fully supported at the moment. It is okay to use dvSwitches for VM traffic; however, the software requires that all other traffic (VMKernel ports for vMotion, storage traffic, and management) goes through standard vSwitches. 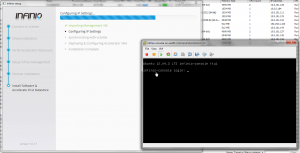 VMkernel Port for NFS Traffic - should be separate from the VMkernel port used for management traffic. Additionally, it should be on a separate subnet and/or VLAN from other VMkernel ports, ensuring there’s only one path for NFS traffic to travel. Lastly, the IP address for this port should be static. 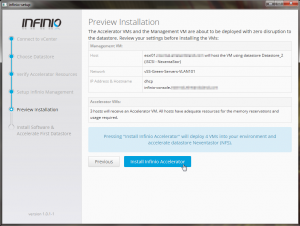 Virtualized vCenter - if vCenter is run as a VM and vSphere 4.1 is being used, the datastore vCenter resides upon cannot be accelerated. Additionally, any other datastore that uses the same VMkernel port as the vCenter datastore cannot be accelerated either. This limitation will be removed before the GA release. 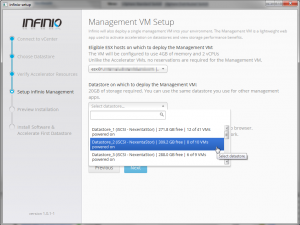 vSphere 5.x is not affected by this limitation. Now after you have read the above I would like to point out a few key areas which will save you some time. Make sure that all of your networking components are configured correctly in regards to the above requirements. My lab was setup in a pure VDS (vSphere Distributed Switch) implementation which meant I had to make some changes before proceeding. The first thing I had to do was move my Management, vMotion and NFS VMKernel Ports over to a VSS (vSphere Standard Switch). 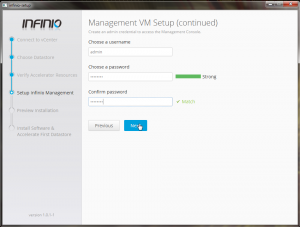 You will also need to create a portgroup on your VSS for the management connection of the Infinio console vm. It will not work on a VDS porgroup. Another thing to point out is that you should only have one VMKernel port for your NFS traffic. I had two configured for multipathing (RR DNS :) ). What happens is that if you have two VMKernel ports, Infinio will only attach itself to one of those therefore if one of your hosts connects to your NFS datastore using the other VMKernel port you will not see any activity within your Infinio dashboard as well as not be accelerating anything. One last thing is that if you have more than one vMotion VMKernel ports then they both must reside on a VSS. I initially only moved one of mine over and during the install it would fail because they were both not in the VSS. 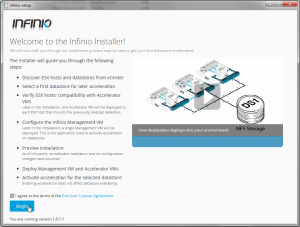 So now that all of that is out of the way let’s actually install Infinio. First you will need to download it which you can get from here and then extract it. Now launch infinio-setup.exe agree to the terms and click Begin. 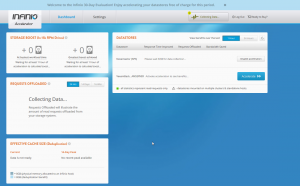 Now select the NFS Datastore that you want to accelerate and click Next. So if you do see this error you should fix the issue and then click Retry Validation. 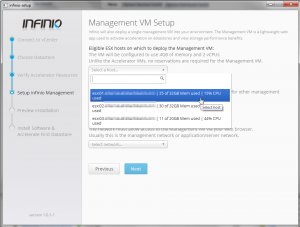 Now select a Host to deploy the Management VM to. 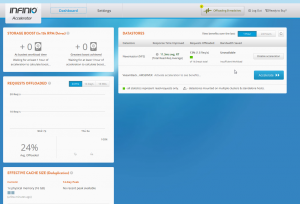 Select the Datastore to deploy the Management VM to. Confirm all looks correct and click Next. 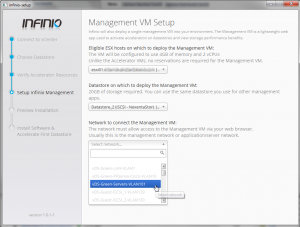 Now enter a hostname and select DHCP or Static for IP assignment for the Management VM. 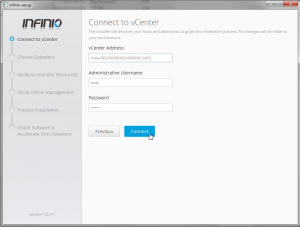 Enter a username and password for a web login into the Management VM. 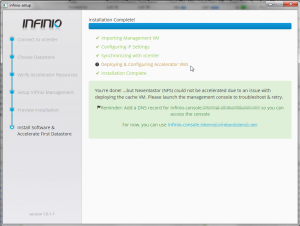 Now finally confirm everything looks good and then click Install Infinio Accelerator. A little peek at what was going on in the background if you were to look at vCenter while everything is being deployed. 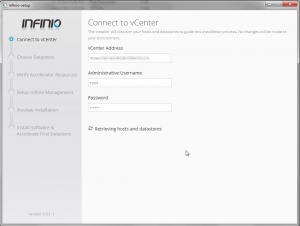 Now after a successful deployment open your web browser of choice and head over to the address or FQDN of the Management VM and login using the username/password that you entered during the install. 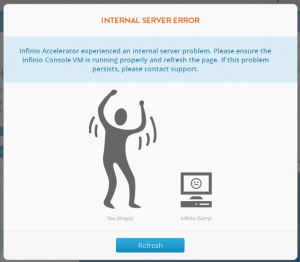 And if you ever run into an issue you may see the following screen which I thought was pretty funny. So now for the testing. I want to set the stage here as I had a lot of other things going on in my environment and also ran different scenarios of testing which lead me to these testing results. Being that Infinio is a read cache accelerator I ended up running a 4 hour test using VMware IO Analyzer using two instances on two different hosts and the tests were setup as 100% read and 100% random. My results showed significant high write latency which was unusual being that on a normal load it is well below 20ms with NFS with and average of 5-7ms. The graphs below do not represent too well if you ask me being that the overall results showed peaking around 100ms. The read latency across all tests stayed extremely low under 10ms. 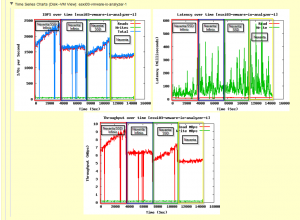 The result that did stand out was the actual number of IOPS generated and throughput. The other thing to note was that for some reason one host generated about 3x the amount of IOPS so my guess is that the slower host was much busier. However this could represent what I may see in real world workloads based on many factors. 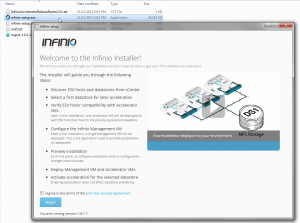 Overall I feel that Infinio will definitely benefit your environment especially over time. I will obviously be conducting many more tests as time goes on to get a better sense of how Infinio can benefit. I should also note that I was informed that there was an issue with Nexenta NFS that was fixed in the latest code level that I used for this test so YMMV. I tried to break out the graph in the 1 hour increments which show where change was made during the test. Those increments go as follows. So as you can see my write latency was through the roof. But it is easy to see where change occurred as expected. So that is it for now. Please feel free to provide feedback.